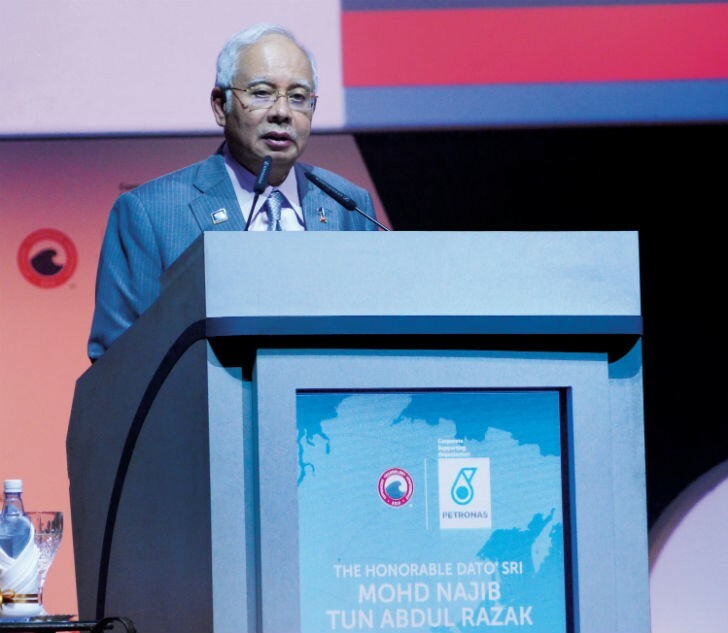 The Honourable Dato’ Sri Mohd Najib bin Tun Abdul Razak, Malaysian Prime Minister at Opening Ceremony in Kuala Lumpur, Malaysia, March 22, 2016. Speaking at the Opening Ceremony, ‎The Honourable Dato’ Sri Mohd Najib bin Tun Abdul Razak, Prime Minister of Malaysia said, “It is my hope that the exchanges and discussions you have over the next four days will provide you with insights and fresh perspectives that will benefit all in the oil and gas technology industries. Let this year’s conference theme of Excellence in Asia be a rallying call for everyone present”. Datuk Wan Zulkiflee Wan Ariffin, OTC Asia Advisory Committee Chairman, and President and Group Chief Executive Officer of PETRONAS said, “Our theme for this year’s OTC Asia, Excellence in Asia, hopefully extends the same forward-looking sentiment to this gathering of the industry’s best and brightest, and will set the tone as we collectively navigate through the current turbulence”. He added, “I hope that the sessions here at OTC Asia over the next few days inspire the pursuit of excellence in all of us, and also reveal the potential of the region, countries and industry players of Asia in playing leading roles on the global stage”. Participants will hear from high-profile speakers, gain invaluable insights from a comprehensive technical programme, and experience a showcase of leading-edge technology and innovations at the event’s exhibition. The inaugural Next Wave Asia programme - themed “Addressing Career Challenges in a Dynamic and Uncertain Energy Landscape” is aimed at young energy professionals to better understand and adapt to the current business environment, and supporting them in building successful and sustainable careers. A full house of attendees heard from Dato’ Wee Yiaw Hin of PETRONAS and senior executives from ExxonMobil, Hess, Shell and Wood Mackenzie. In the face of global oil price challenges, many of the senior industry figures urged perseverance and optimism. Asia has long been at the cutting edge of the offshore oil and gas industry, in terms of technology, innovation, project execution and talent. It is this preeminent position that will help the region weather current market conditions, and is reflected in the theme of the event: "Excellence in Asia". The conference programme features two plenaries providing insights into overcoming technology gaps and maintaining growth through cost leadership, and reflecting on successful leadership in other industries; ten panels discussing current trends such as cost reduction through innovation, oil price volatility and implications to the industry, next generation workforce and FLNG; 18 special sessions and country briefings with presentations into on-going major regional projects, market outlooks and investment climates; and more than 300 multi-disciplinary technical sessions and presentations on various offshore aspects of geoscience, deepwater, subsurface and surface engineering, facilities and construction, and more. Malaysian Prime Minister Dato' Sri Mohd Najib bin Tun Abdul Razak visiting the exhibition.